American painter and engraver; born at Turek, near Kalisz, Russian Poland, Nov. 23, 1833. He studied at Berlin under Karl Harnisch, and at Paris under Martin Thurwanger, whom he accompanied to the United States in 1849. Settling in Philadelphia, he studied at the Pennsylvania Academy of Fine Arts and introduced the use of chromolithography. When the Civil war broke out he followed the Army of the Potomac as official illustrator for the United States Military Commission. In 1872 he invented the sand-blast process of engraving patterns on glass. Rosenthal has received many prizes and diplomas. He has etched more than five hundred portraits, a collection of which is preserved in the Smithsonian Institution at Washington. He illustrated Longfellow's "Building of the Ship," "Legend of Rabbi ben Levi," etc. His latest painting is "Jesus at Prayer." 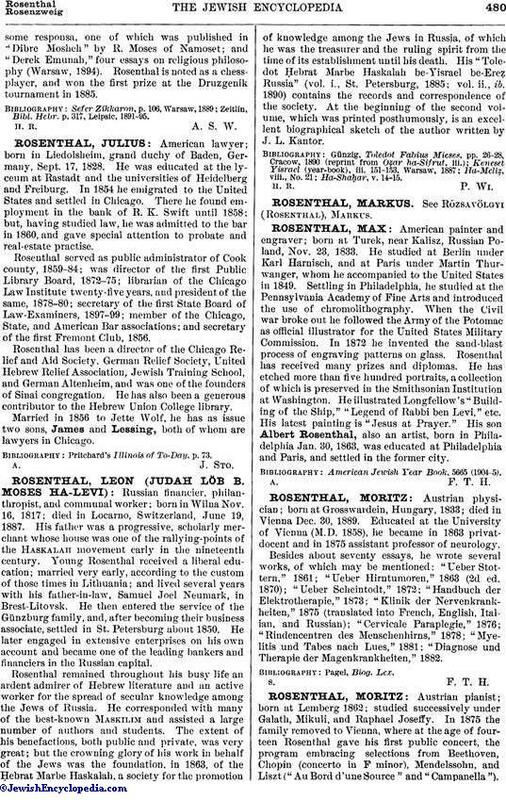 His son Albert Rosenthal, also an artist, born in Philadelphia Jan. 30, 1863, was educated at Philadelphia and Paris, and settled in the former city.